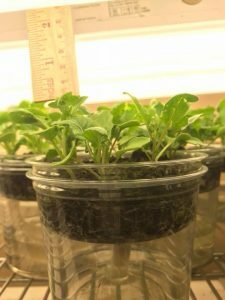 Maybe you’ve grown Wisconsin Fast Plants before, or perhaps you’re just getting started–either way, we all want to grow strong, healthy Fast Plants. Nobody wants tall, spindly plants that need support or sickly plants that barely flower. No problem! Read on, and we’ll explain three common pitfalls to avoid when setting up growing conditions that support healthy Fast Plant growth. Positioning your Fast Plants too far from their light source causes seedlings to grow long, spindly stems and small leaves. 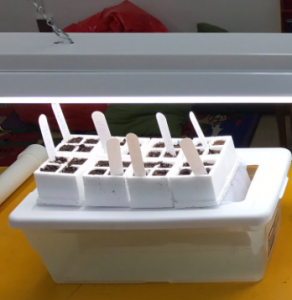 In addition, plants grown under low intensity light grow more slowly. Keep in mind: light intensity received by your Fast Plants is a function of the light source output AND plant distance from the light (great learning moment for the physics of light). Tall labels used can cause too much distance between the “soil” surface and light source at just the time when light intensity is most critical. If your Fast Plants are still reaching, even when positioned within an inch of their light source, it could be time to change your bulbs (they deteriorate over time). Also, consider adding aluminum foil curtains to reflect light back to your plants. 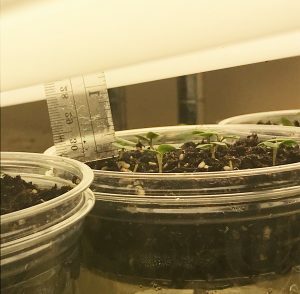 Emerging seedlings kept an inch or so from a high intensity light source grow short, strong hypocotyls (aka the stem between “soil” surface and first leaves or cotyledons). Better yet, measure your light output to see if plants are receiving 200-300 micromoles PAR at plant top level, and use your data to fine tune your lighting. new enough light bulbs that they’re emitting full intensity–remember, what looks bright to our eyes is not the same as the light intensity that plants need! Use a PAR sensor or meter to be sure. Learn more about building or choosing a good lighting system on our website in Step 4 of Preparations. Fast Plants can tolerate and grow in a wide range of temperatures. However, if you’re planning on having healthy Fast Plants that flower in two weeks after planting, then temperature matters. Colder temperatures slow down growth and development. Conversely, warmer temperatures speed up growth and can cause plants to grow spindly. Keep in mind, the optimal temperature range for growing healthy Fast Plants is between 72°F to 82°F (22°C and 28°C). 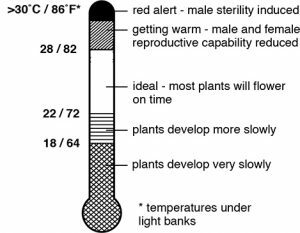 Note that this refers to the temperature under the lights, next to the plants. 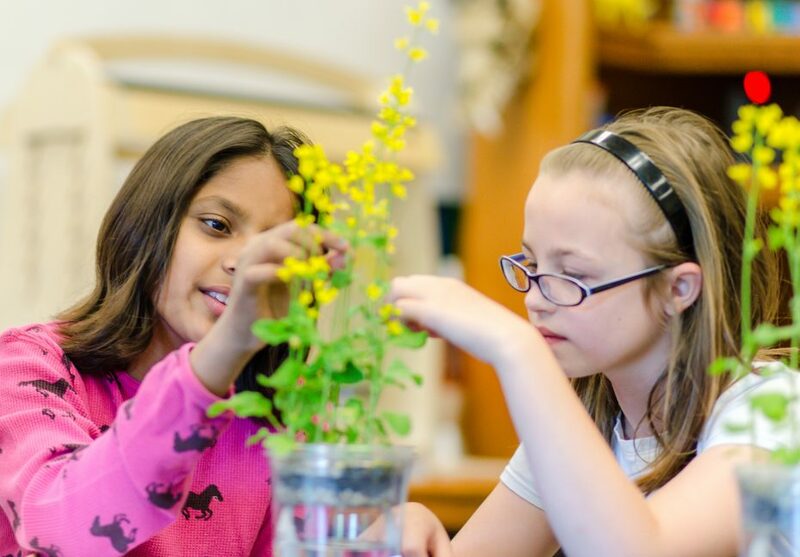 Learn more about temperature and other physical, biological, and chemical elements that can affect how healthy Fast Plants grow in this blog series. While we see most easily how quickly Fast Plants grow above ground, it’s the root system below ground that support healthy Fast Plants. Therefore, Fast Plant roots need to grow in a light substrate that retains moisture and makes oxygen easily available. For these qualities, soil-less planting mixes or seed starters are ideal. We recommend shopping for a quality soil-less mix that is not made from coconut husks. For some reason, we’ve found coconut husk products don’t seem to supports healthy Fast Plants growth and development. Jiffy Mix, Scotts Redi-earth, or the soil-less mix that Carolina Biological supplies are all good options. In addition, Miracle-Gro seed starter is a good option. However, avoid mixes with added fertilizer if you’ll be conducting experiments that involve fertilizer as a variable. To help prepare for planting, download or print our soil and fertilizer shopping list. In addition to providing your Fast Plants with the environment they need for healthy growth, they need your attention. Look after your Fast Plants every day. Check to see that water reservoirs are filled and that all is well. You can learn more about other physical, biological, and chemical elements that affect Fast Plants in our environment blog series. Also, you’ll find step-by-step growing instructions on our website for growing healthy Fast Plants. To learn more about growing Wisconsin Fast Plants visit the Grow section of our website and watch our YouTube Growing Fast Plants playlist.